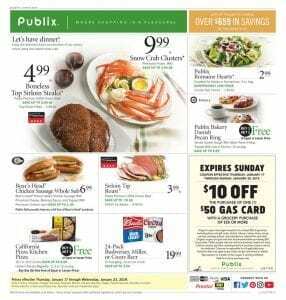 Publix offers are suitable for the ones who like high quality groceries and fresh produced meat. You can always prepare delicious and extra ordinary dinners for your loved ones with Publix offers. Please explore Publix Weekly Ad Deals Jan 17 - 23 2019 to decide what to buy this week as grocery shopping. Organic vegetables, breakfast needs, wine selections, meal kits are waiting for you. Do you have party plans? How about serving little smokies or Margaritaville appetizers? Also check out Mama Lucia meatballs and seafood appetizers which are great as part dishes. Dinner ideas are another topic of this ad. Get the inspiration of what to buy as dinner for your company via Publix offers. There is good alternatives of seafood, pork, meat and chicken choices. When it comes to healthy nutrition, Publix organic vegetables and vegan choices are good idea to consume. For example organic Asparagus always goes great with fresh cooked meat. As fruits, you can find apples, oranges, grapes, nectarines, pears and many more options. Check page 8 to see the offers for lunch, snack or dinner. Sandwiches, chicken wings, chips, salads and cheese varieties are available. Sometimes it's ok to give some chance to carbs so consider buying some delicious muffins, Italian bread, cakes and buns. All these delicious choices can be found on page 9. Don't miss buy 1 get 1 offers on page 10 to complete your weekly grocery shopping. Cereal, coffee, canned vegetables, healthy juices etc. are available. Also you can see more BOGO deals on page 11. Another saving chance is on health and beauty items like shampoo, body wash and lotions. In addition there are household items with high quality and low prices. Take a look at baby products, batteries and disinfecting sprays on page 15. Always plan your shopping and save in style. Sirloin Tip Roast $3.99 lb.